Potatoes have a bad reputation as many people think they will gain weight from eating too many. I love potatoes and eat them almost every day. That’s why I thought it’s about time to tell you about the great health benefits that potatoes come with. In fact, it is an amazing weight loss food as long as you prepare it right. Steam or cook your potatoes for 25 minutes without using any salt. Don’t use any oil or salt no matter how you want to prepare them :-). Eat them once they have cooled down. This makes a huge difference in the way the body digests them. -> The starche of cold potatoes can’t be turned into fat no matter how many you eat. Buy organic if possible. They taste much better and you are save to eat the skin as well. Potatoes have 77 kcal / 100gr which makes them the perfect weight loss food. Potatoes contain zero fat, zero cholesterol and zero sodium, so there is no chance they will ever make you fat. Although potatoes only contain 2% of protein, the essential amino acids of these 2% protein are in the perfect ratio for our body to absorb and therefore will be 100% usable for us. Animal protein sources, such as meat, which have almost 50% of protein, have an unbalanced ratio of amino acids and are therefore not nearly as usable for our body as plant based protein sources. Potatoes are considered to be one of the best foods with potassium and contain more potassium than a banana. Potassium is essential for our body as it is part of every body cell, especially important for our muscles cells. That’s why potassium rich foods like potatoes and bananas make the best fitness foods. Vitamin B6 is part of the protein- and energy metabolism, which is very important in order to have enough energy to workout and to achieve great fitness results. 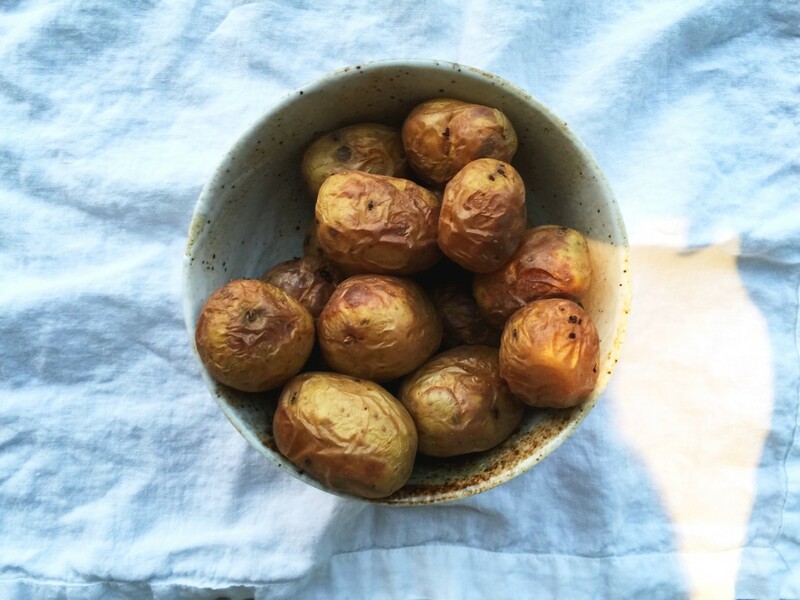 Potatoes are full of Vitamin B6 and Vitamin C, which supports our immune system and helps to prevent cell damage. Many people these days have an iron deficiency. Especially for us women it is important to eat iron rich foods as we loose iron through our monthly period. Potatoes are a great source of iron as one medium sized potato provides us with 6% of the daily recommendation dose. I hope you find these information helpful and will no longer hold yourself back form eating potatoes :-). Just keep an eye on how you prepare them and don’t use any oil or salt and you are will get all the amazing benefits they come with. Besides sweet potatoes, what kind of potatoes dontoubwatband recommend? die Kartoffeln auf dem foto habe ich in einem steam Ofen gemacht da werden die sooo gut:):) in London habe ich auch einen ganz normalen Ofen und da werden sie auch super aber koche sie auch gern ganz normal und mach dann die Haut ab. If you want to lose weight eating sweet potatoes, can you eat as many as you like? Also, is it healthy to fry them in coconut oil to change it up? so sorry for my late response. Oven baked potato wedges are AMAZING and the perfect healthy alternative to regular french fries. You can eat as many as you like every day and don’t have to worry about calories at all! No salt/ no oil baked potatoes really are the perfect dinner on a high carb vegan diet and are so satisfying as well. Try to add a large green salad to your dinner to get your greens in. 🙂 I love potatoes and have them almost every day lately. Plain steamed/ baked potatoes have zero fat and therefore will never make you fat. 😉 Hope that helps! Hi Becky, bei kalten Kartoffeln wird ein Teil der Stärke in den unverdaulichen Ballaststoff Inulin umgewandelt und kann deshalb nicht in fett umgewandelt werden. 10-15 min abkühlen nach dem kochen reicht da schon. :-)) Und am besten nicht salzen:). Quick Q: Wie machst du die kartoffeln so? Bei mir werden immer entweder knusprig und trocken oder matschig aber saftig. Die auf dem Bild sehen so gut aus!